Are there any restrictions to the use of your products? Not really, but we do ask you to follow the recommended daily use printed on the package. If you are pregnant, have hypertension, allergic symptoms, hyperthyroidism or acute rheumatic symptoms, please do not use roseroot found in SINNI and PUHTI. People with harts allergy should avoid KERKKÄ Spruce Sprout Powder. Why would I choose your product among all the supplements on the market? First, Lapland is one of the purest areas in the world. Secondly, the arctic conditions – the nightless nights of summer and long, dark and harsh winters – load the Lappish herbs with powerful substances which cannot be artificially copied. We get the herbs for our products from local planters and pickers and take care of the production ourselves. Thanks to the gentle but effective production processes we are able to make use of the whole herb, which make the effect more holistic than consuming a single vitamin pill, for example. I have a very sensitive stomach. Can I use your products? Yes you can! Angelica is especially good for digestion and preventing problems in the digestive tract. Honey is a natural antibiotic preventing bacteria. It’s a gentle choice for your tummy. Why do you use vegetable glycerin in some of your products? Where does it come from? Vegetable glycerin is one of the best ways to extract both water and fat soluble particles. By using vegetable glycerin we can guarantee that you get the best out of the Lappish herbs. Unfortunately we are not able to get Finnish vegetable glycerin, and therefore, import it from the UK. Our vegetable glycerin is 100 % natural and meet the European Pharmacopoeia (EP) Specification. How on earth do I open you easy-to-use package? Can I give you products to my children? MAHTI is an excellent product to boost your child’s immunity. It’s suitable for kids from one year up. Have a shot or less is enough for a toddler. School children can have the whole shot at once. SINNI is recommended for kids over three. Half a shot is enough for kids under 7. PUHTI is recommended for kids over a year. It has less roseroot than SINNI and thus be taken several times a day as a healthy snack. KERKKÄ Spruce Sprout powder and our other arctic superfoods are safe for children as long as they eat them moderately. Do I have to take your products daily? Not necessarily. In fact, taking 2 dosages of MAHTI per day for 5 days in a row is a good way to keep the flu away when you feel like catching a cold. The same dosage goes for SINNI if you feel stressed or need a boost for an upcoming sports event. 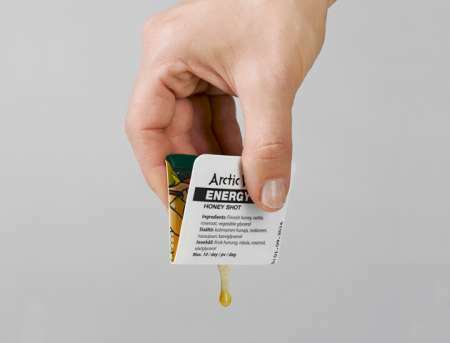 Anyhow it it always a good idea to boost your life with some Arctic herb everyday. Do the products have a best before date? Bottles and jars can be recycled with glass. Especially bottles can be also re-used at your home after wash. They are high quality and super strong! Single herbal shots aren’t. We are all the time looking for a recyclable material which would be strong enough and meet other quality standards. More news on this soon! What is the energy content of your products? Check energy content of each product from each products’ own page. We have a wide network of resellers all over Finland. Our re-seller network world wide is growing rapidly. Or order from our webshop all over EU.